The automated fingerprint identification system (AFIS) is a system for storing and processing digital fingerprints. 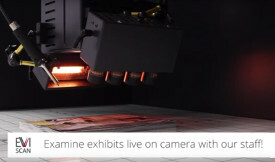 By digitizing the fingerprints, found traces can be compared to those recorded in the database. The system was launched in Germany in 1993 and today it contains about 3 million fingerprints. AFIS is used mainly for two areas: the fingerprint verification and fingerprint identification. The fingerprint verification is used, for example, in the high security sector to give only certain people access to different areas or data. 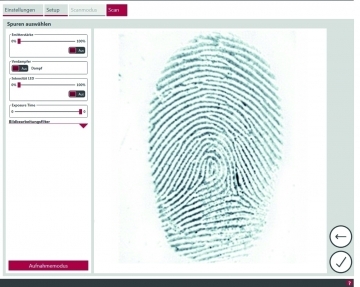 Here, a fingerprint scanner compares the features of the present finger print with records from a database. For the fingerprint identification a found or present fingerprint is compared with the stored fingerprints in order to allow an identification. Matching items with the AFIS database must then be checked and verified by a dactyloscopy expert. The fingerprints found with EVISCAN can be immediately integrated into the database and thus are directly available for fingerprint identification. In the United States the 1999 introduced IAFIS (Integrated Automated Fingerprint Identification System) is used instead of the AFIS. In Europe, an additional database for fingerprints, the EURODAC (European Dactyloscopy), is maintained.